Most people see their tax preparer, financial planner, and doctor at least once a year—but who's watching out for their investment in real estate? Shouldn't it be the person who sold it to them? 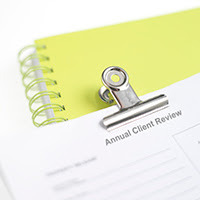 The annual client review (ACR) is easy to perform and so unexpected that clients will look forward to it and spread word about the value of your service far and wide. The annual client review is a current snapshot of the market, which impacts the value of your client's home. Rather than a simple comparative market analysis, the ACR should account for relationships between price per square foot, assessed value, and current market value. You can perform an ACR on the anniversary date of purchases, do a batch each quarter, or fill up your "slow" month and handle them all at once. Make sure to create a nice looking bound package, mail it with a cover letter, call the client to tell them you sent them something, and follow up with a phone call in a week or two to review the findings. Easy! What if it's bad news? Most clients will appreciate your candor—better this news comes from a trusted advisor like you than a stranger. Besides, you don't want clients making serious life and financial decisions based on faulty information. Don't be surprised if annual client reviews become the single most important business generating activity for you. Yes, it takes a little work and you may have a lot of clients! Our advice: test 20 and see what happens!